A rogue planet is rushing madly toward Earth when maverick scientist Dr. Zarkov (Frank Shannon) hopes to avert disaster by traveling to the new planet in his experimental rocket. 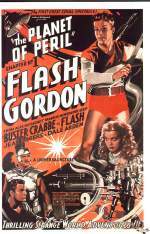 Two strangers, the athletic Flash Gordon (Buster Crabbe) and damsel in distress Dale Arden (Jean Rogers) go with him. The three of them soon find Mongo to be a planet of wonders, warring factions, deadly perils and strange creatures. Later they discover that its orbit is controlled by Emperor Ming (Charles Middleton), who has his own sinister plans for Earth. Also stars Priscilla Lawson. A former Olympic swimmer, Buster Crabbe acted only occasionally after World War II, devoting much of his time to his swimming pool corporation and the operation of a boys' camp in New York. He died on April 23rd, 1983 from a heart attack. He was 75. 13 chapter serial, 2 VHS or 1 DVD-R set.